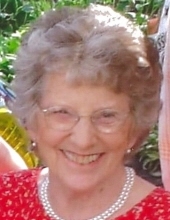 Naomi C. Schleper, 93, of Iowa City, died Saturday, April 6, 2019 at Legacy Gardens in Iowa City. Private family graveside services will be held in Yorkville Cemetery in Union Grove, Wisconsin. Naomi's family will greet friends Thursday, April 11, from 4:00 pm to 7:00 pm, at Blackstone, 504 Westbury Drive in Iowa City. Her family will then greet friends Saturday, April 13, from 1:00 to 4:00 pm, at Hob Nob Supper Club, 277 Sheridan Road in Racine, Wisconsin. Naomi Clara Schleper (nee Schneider) was born October 15, 1925 in Sheboygan, Wisconsin. Her father, Johann Fredrick, and her mother, Amolia Leih (nee Kramer) had both been married before but their spouses died during the flu epidemic. They also shared a common background of being Volga Germans from Russia although from different villages. Jacob. Vera, Lydia, Esther and Fred were the children they brought into the marriage. After they married, they had seven more children with Naomi being the middle child of that group. Her older siblings were Sally, Clarence and Lillian. The younger ones were Harold, Gloria and Virginia. Only Virginia Price still survives her along with many nieces and nephews. Also surviving her is her daughter, Deborah (James) Harvey, Her grandson Blake (Aleesa) Kittrell and great grandchildren Briella and Bennett. And her beloved Pug, Tammie. Also surviving are her grandchildren, Joel and Ahleena. Johann was a master carpenter and did well until the Depression years hit. Then they were forced to sell their house and moved to Racine County where they farmed and did field work or whatever they had to get by. Naomi started weeding at 4 to help her father. Later, she and Lilly did most of the housework since their mother started working at Frank's Kraut factory. High School was not a given back then so Naomi worked as a nanny in Union Grove so she could continue her education. She was the first in her family to complete high school and then moved out to San Francisco to be with Lilly where she worked a number of jobs. Eventually she was recommended for the Cadet Nursing Corps and continued her education as a nursing student at Michael Reese Hospital in Chicago. Since most of the nurses were in service at the time, the nursing students ran the hospital, putting in long hours along with their class work. She graduated in 1948 and was one of the few in the country with experience in premature nursery care. Later that year, on September 4, she married Bruno P. Schielzeth in Racine. They moved to Gainesville, Florida so he could get his BS in Botany. Naomi worked at University Hospitals in the nursery. It was there that their son, Bruno Robert, was born. Bruno's education was interrupted by a family emergency and they moved to Michigan briefly before going back to Racine. Their daughter. Deborah Jean, was born there. In 1953, they bought a house in Yorkville. Bruno started a landscaping business and she was a stay at home mom until the children were in school. She then worked at Southern Wisconsin Colony. At that time, it was a state institution for the physically and mentally handicapped. And a few years later, at St Luke's Hospital in Labor & Delivery/nursery. She became very involved in the community and Yorkville Methodist Church. Eventually she became an office nurse at Racine Medical Clinic until she moved to Iowa City, Iowa where Bruno was Park Superintendent and she worked at the VA Hospital. It was here that the marriage dissolved and she transferred to Wood VA Hospital in Milwaukee. On Nov 23, 1974 she married Dr. Schleper (Papa Doc). They enjoyed years of traveling, visiting 26 countries and most of the United States. Doc died July of 2007. In 2011 she moved out to Iowa to be closer to her daughter and family. Bruno Robert died Sept 2012. She continued to enjoy traveling and shopping, visiting many different quilt shops. After moving into a retirement community, she enjoyed knitting hats for newborns. Not long after her 93rd birthday, with declining health, she passed away on April 6th, 2019. To send flowers or a remembrance gift to the family of Naomi C. Schleper, please visit our Tribute Store. "Email Address" would like to share the life celebration of Naomi C. Schleper. Click on the "link" to go to share a favorite memory or leave a condolence message for the family.